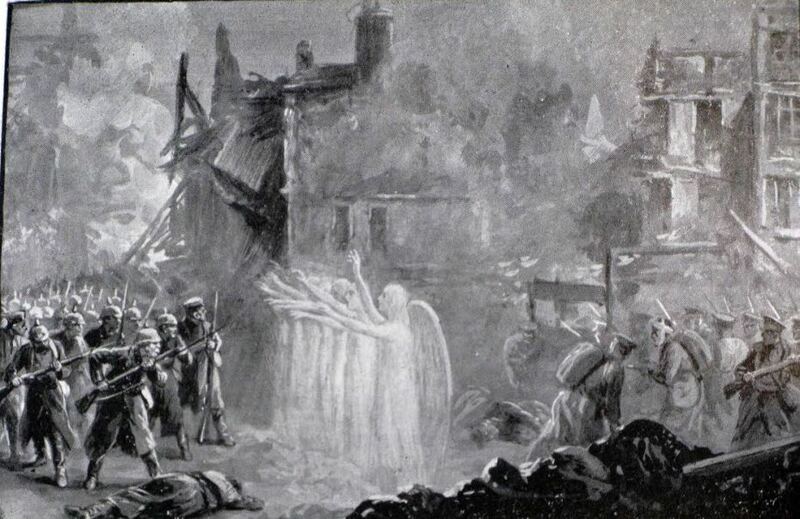 Home » Did a UFO disguised as an angel save British soldiers in World War I? Did a UFO disguised as an angel save British soldiers in World War I? A new book claims that an ‘Angel’ which is said to have appeared above one of the first battles in World War I, saving the lives of fleeing British soldiers, might have been an extraterrestrial visitor – a flying saucer on a mission to ‘alter the future’. The Angel of Mons was described as either St George, St Miichael, angels, or crowds of angelic warriors as it fended off advancing Germans at the Battle of Mons in 1914 – and was reported at the time by the Evening Standard. The story was swiftly turned into myth by the soldiers themselves – and became a staple of parish magazines, and cited as evidence that God was on the British side. But a new book, ‘UFOs of the First World War’, says that many UFO enthusiasts now believe that the ‘angel’ was an alien visitor – shaping itself into a form that would have been recognisable to the exhausted British soldiers fleeing overwhelming German might on the battlefield. The battle had been one of the first in which the British faced the Germans – and despite retreating, only 1,600 lives were lost. Others claim that the story is simple fiction. The popular author, Arthur Machen claimed that this legend was created by his fictional ‘The Bowmen’ story published in The Evening News, 29 September 1914. In it, British soldiers call on St George for aid, and are helped by ghostly bowmen from the Battle of Agincourt. One fact that lends weight to this theory is that few reports of the incident exist before Machen’s story. ‘UFOs of the First World War: Phantom Airships, Balloons, Aircraft and other Mysterious Aerial Phenomena’, History Press.